This week has been kind of busy. Mostly with farm visits and my roping. I was up Friday twice, Saturday twice and Sunday once. Then Monday I was so tired I couldn’t get much done but the farm visits kept on coming. Friday I was up at Cavalcade. 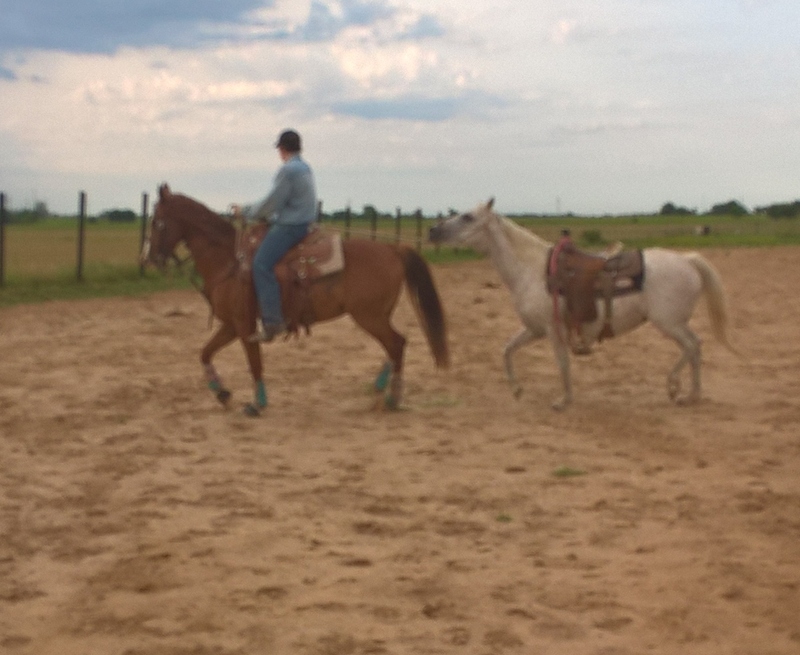 I did my Calf Roping in the morning and my Team roping run in the evening. My morning run won me the long go in the calf roping. For my Team roping my header missed and I never got to throw my rope. It is okay though my header was young and he had been there camping all week and going to the lake swimming. I think he was just plain tired. Saturday we had farm visits and reading program in the morning. That afternoon I sorted all the lambs and penned them off so they can be weaned. Even with all that going on I still had plenty of time to make two rodeos. The first rodeo was at Slick and I was up during the evening performance. I managed to win the calf roping event there, however I left before I knew that and headed to rope in the slack of another rodeo in Turley. In the second rodeo I didn’t do any good. Honestly, I should have skipped it but for some reason I felt I needed to try and make that one too. The issue wasn’t so much that I didn’t do any good but it was more that I didn’t get home until after 4am and I had to take care of my horse and get a shower so I didn’t get in bed until 5am and I had to be up by 8am for the short go at Cavalcade Sunday morning. By the time I got there Sunday morning I was pretty sure I wasn’t up to it. I posted a video on Facebook but can’t figure out how to post it from there to here. I will tell you now that I face planted my dismount and roped the calf by a back leg. Nope it wasn’t a pretty site. Don’t worry I didn’t wound anything but my pride and if I was going to miss that was the rodeo to do it at. Besides I am sure that someone needed to see me fail for some reason … It was all God’s plan. I spent the rest of my free time getting my intro for my patreon Acct made and Storm’s adoption video done. You can check both of those out and let me know what you think! So this week has been crazy. After spending Harry’s last days with him in the hospital, we have kind of gotten behind. We had his celebration of life on Sunday. After that the rest of our week has been spent trying to get caught back up. Everything from posting sheep needing forever homes to getting the house cleaned. We have a ton to get done. One big thing that happened is that the tractor got finished. Dad and I moved it back home Monday. When we got it here everything was working just fine. Then tonight when Dad went to use it he found he had cracked the gas line and left the key on so the battery was dead. Mom was a bit upset as the work we needed the tractor for isn’t getting done either. Last night I was out late as I was practicing for Cavalcade. 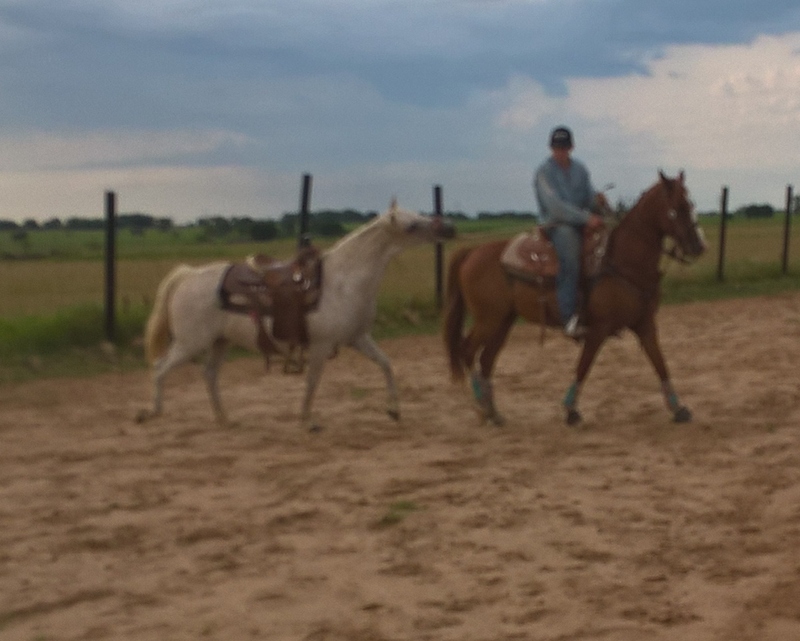 I will be up this Friday Morning in the Calf Roping and then that night for my Team Roping. For those of you who don’t know what Cavalcade is You can check it out Here The short explanation is that Cavalcade is the World’s Largest Amateur Rodeo. Cavalcade goes on for a week and there are things like dances every night but honestly I am not really interested in all that stuff. I just want to rope! I didn’t get to rope last weekend because my rodeo was cancelled. I did practice last night and I am going to a friend’s house to get some more practice tomorrow as well. With any luck I will be able to hold my own and maybe even bring home a paycheck this year. As many of you know things have been going kind of crazy around here this week. Well, while life was happening so were things on the farm. With me now out of school and trying to actually find my place in the world doing what I love Mom is trying to find ways to make things a bit simpler on each of us. She started with a schedule but so far that hasn’t worked because as most of you know Farm life Changes without warning in a heartbeat. However, there are somethings that we are going to put on a schedule and for good reason. First, we will still podcast on Saturdays. Starting next week I will blog no less then on Wednesdays. Then about 3 other times each week I will be posting to our newly established Patreon Page. It was suggested to us and after doing some investigating and giving it some thought I figured it would be a good combination for the farm. We just got our single gift sponsorships up and running and they are working beautifully. Because we buy in bulk straight from the mill, each sponsorship pays for two bags of feed. Each bag will feed the whole farm twice a day for about 3 days. If you haven’t seen the sponsorships or taken time to sponsor an animal, and you want to, you can do so HERE. Today we have moved on to phase two. We want to give those that want to continue to give a chance to do it their way as well. That will start with a Patreon Page. For those who don’t know what Patreon is I will try and give it a whorl and see if I can explain it. You see right now we are giving our blog and video content away free. That is one of the reasons why we have stopped putting up to many tutorials. They take so much time to make and the animals get no return or benefit from them. It would be different if the animals needing home were getting interest online but at this point they are not benefiting in anyway. Sadly, we are to small for the youtube platform to pay us and growing our channel requires even more time that we just don’t have. With Patreon, followers can pledge a monthly gift and view all our content for one price. We allow pledges starting at just one dollar a month, however, if you pledge more you get a few extras as well. I figure that if I don’t know one person who has enough extra money to pay big bucks for my content at least I pray I have many more friends and followers that have enough faith in our work that they would be willing to help a little each month. So what are we going to put on our Patreon Page? Well, the content is going to be centered around three areas. The main area is going to be working with the animals. You will see us actually doing it and learn why we are doing what we do in each session. You will see what works and I am sure you will see what doesn’t. You will also get to see the progress up close and personal on all of the animals that we are working with here on the farm. The other two areas of videos will be supplements. 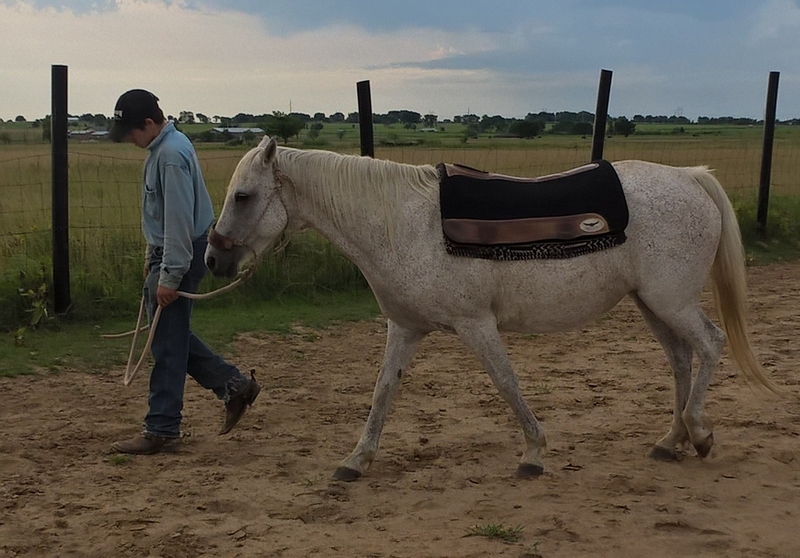 The first will be centered on my roping. 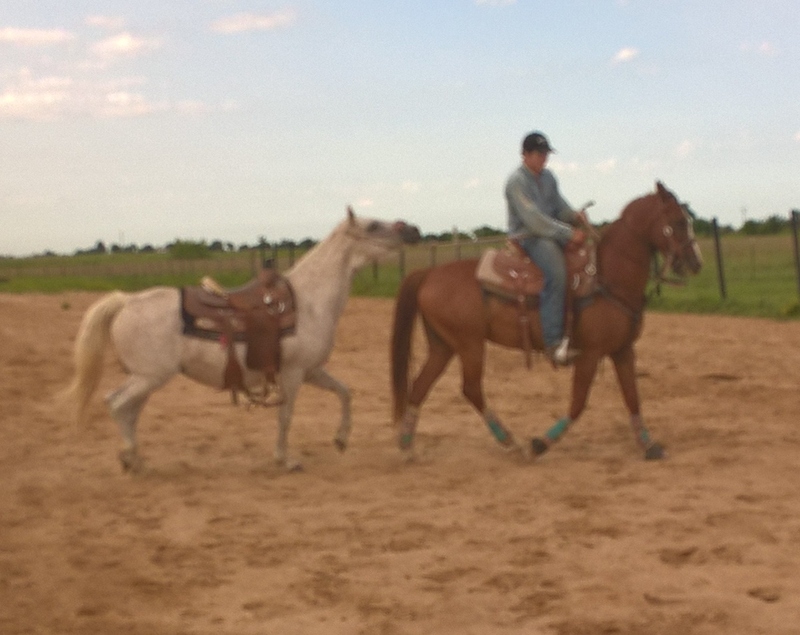 I will show how I practice on the horses as well as ground work practice. 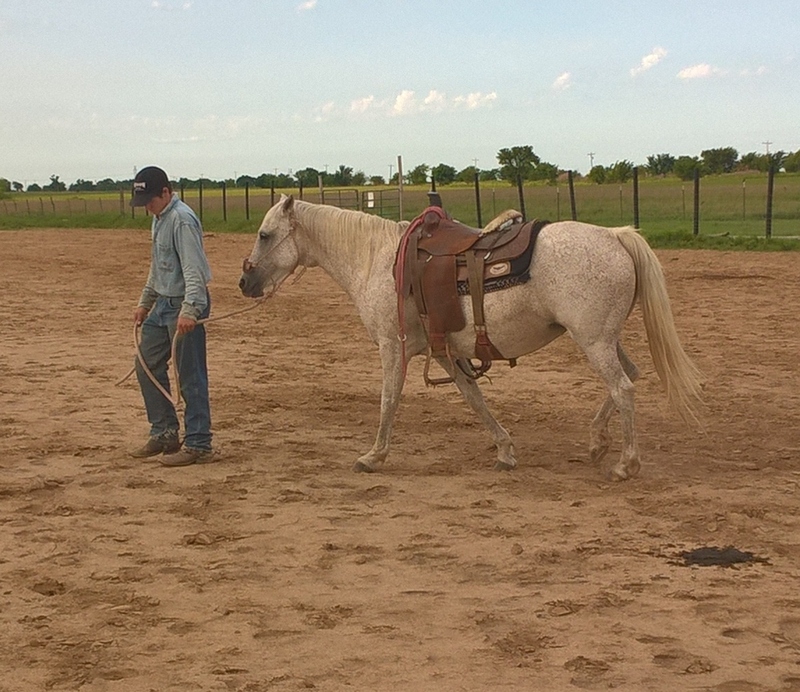 I will explain everything from the ropes and tack I use to how to figure out terms used in roping as well as covering what issues can effect your roping. There will be both tutorials and great informational videos. The other area is a small one as well. It will be posts about projects going on “In the Farmhouse” as we call it on the podcast. If you watch our podcast you will know what that segment covers. If not, an easy way to explain it is DIY things we are working on and our personal lives. With this format I hope to do my part to help make this farm be able to sustain the animals that are here as well as rescue more in the future. If you want to check us out you can find our Patreon page HERE. I want to thank each of you for sticking with us through the years and we hope that you will be patient as we learn to make better behind the scene videos and navigate this new path we are on. And remember the podcast will still post on the weekends but it will just be kind of a recap type thing. And the blog will post at least on Wednesdays but if something exciting happens or something really important needs to be said I will still be making other posts from time to time. I honestly pray that this works because all it takes to make this work is me strapping on the Go Pro and you. I think I can get you behind the scene footage while doing what I need to do during the day. If it works you will get more video and I will not have to find extra time in the day to work online. You really will be right here on the farm with us seeing things first hand. I think I am most excited to see how this works the next time I work the sheep and goats … LOL … I am hoping it will be interesting as well as fun. This after Noon Dad’s Dad went to join his wife and Lord at heaven’s gate. Dad has only been home to sleep since Tuesday when this all started. The rest of his time has been spent at the hospital. We all had our time to say good bye and are at peace with it but Dad didn’t want him to pass alone. So he stayed with him every waking hour. This morning however, Mom and I had to get things ready for the Book Farm on Saturday because tomorrow we are open to the public so we wouldn’t be able to get away. So Dad went to the hospital without us. I got up early to work horses and rope. As most of you know that is how I deal with stress. So I worked the horses for the first time in Days and my heart seemed to lighten a bit. The Vet wanted to me start Sugar and get her in shape to help her body start recovering from her false pregnancy so I took full advantage of that. I even had Mom come help me and I put a halter on Jenny. After that Mom and I were headed to pick up our books and a gather a few supplies we needed. Then we were going to go back and join Dad at the Hospital. However, while we were headed to get our books Dad called and said that his Father passed away. Mom took time to call the preacher so that Dad wouldn’t be alone to deal with everything. Then she called the others in his family that she had numbers for and asked that they pass the word on. We got our hustle on but didn’t get home and done with everything until after the people had come to pick up Dad’s Dad’s Body. For now we will spend time with Dad and make sure he is okay. However, to put a positive spin on this post I hope you enjoy these pictures of Sugar getting in shape!! So far this week has been both a blessing and depressing and it is only Wednesday. Yesterday Morning we were blessed to have an interview on the local TV channel. Here is the link to that Interview. All in all I think it went ok. When we got home things got a bit hectic. My Dad’s Dad is in the hospital. Mom called Dad at work and he came and we spent the rest of the day with him. We came home at midnight got some sleep and got up and off to the Vet around 6am while Dad returned to the hospital. 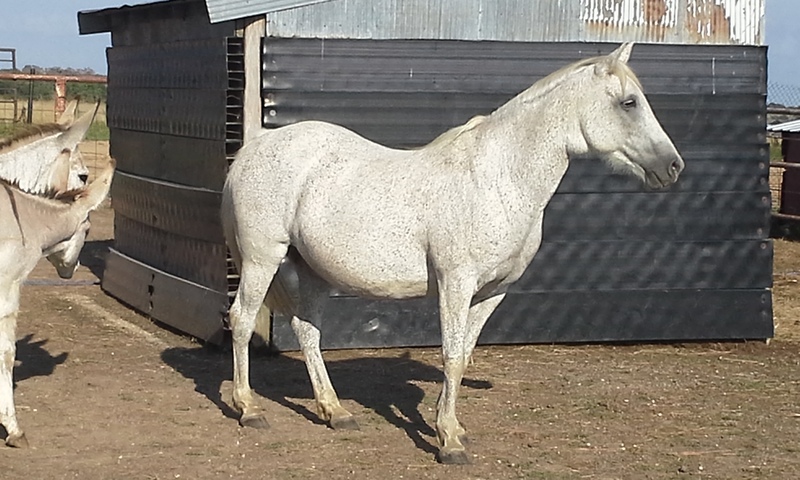 Mom and I took Sugar, (as we are now calling her) the White mare to the vet. There is good news and bad news. First the good. She has healthy teeth and doesn’t need any dental done. She is a bit older then they told us but at 15 she has years of life left in her. Her feet just need trimmed with one crack to watch and her lump isn’t cancer, Strangles or grass glands. It is what you see in an unattended old Snake bite wound. So it is nothing to worry about. Doc did say that where the lump is located would make it to risky to remove. Doc advised us to let it be as it isn’t hurting her. Now for the not so good news. Sugar has been faking her pregnancy. And it looks as though she has been doing it for quite sometime. Doc guesses about 2 years. 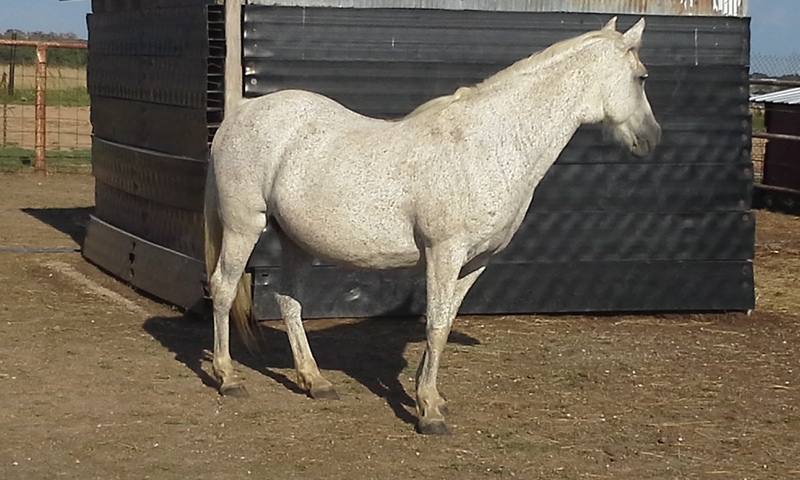 While false pregnancy isn’t really all that common in horses it does happen. So today Doc gave her a shot and sent her into labor to deliver an non-existent mule foal. She did just fine and Doc says I can start riding her, get her into shape and find her a new home. He says her body will be back to normal in about 2 weeks. All in all she is in pretty good shape. After we got home and unloaded Sugar we headed back to the hospital to stay with Dad and his Dad. I came home to do some chores and make sure everything is fine here on the farm. I had a minute or two so I thought I would take some time to post and let everyone know what is going on. I know God has a plan So please say a prayer for us as we work though it. 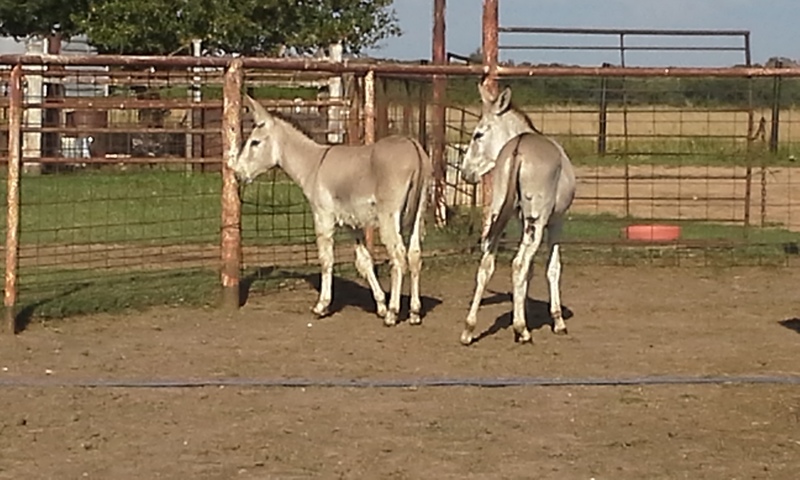 So I will start with the two Donkeys. Mom calls them Jack and Jenny. Well, that is because one is a boy – a jack – and one is a girl – a Jennet or Jenny. The names fit them so we are all now calling them that. They are both young. Just about a year old or so. The plan is to see if we can’t get them halter broke and friendly so that visitors can get to feed, touch and pet them on visits to the farm. We also hope that they will get used to everything and start acting like guard animals for the flock. Jenny is good to go. She is even kind of guarding and running the chickens off. I hope she gets used to everything and just guards against predators. Jack however, has some cuts and scraps on both back legs, his face and his chest. We fly sprayed him to keep them out of the wounds and give them time to heal. If they aren’t healing up really good in a few days we will run him into the chutes and use Underwoods on it with Baking Powder. Once we get him healed up and halter broke he will be heading of to the vet to get snipped. 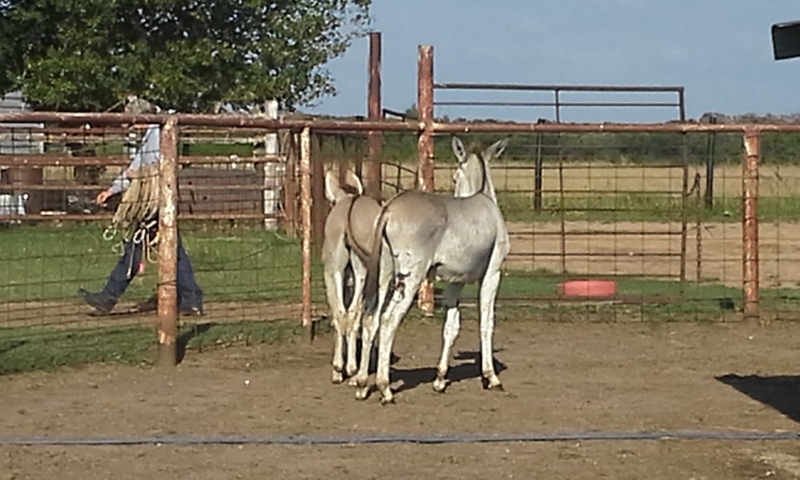 The two Donkey’s are related so no little ones will be in the making for either of them. You can see the cuts in these first two pictures. That leaves a white polka dotted Mare. For starters it looks as if she has Grass Glands. With a bit of luck over the next three or four days it will do down. One thing we are doing to help that along is we will be feeding her from a feeder. 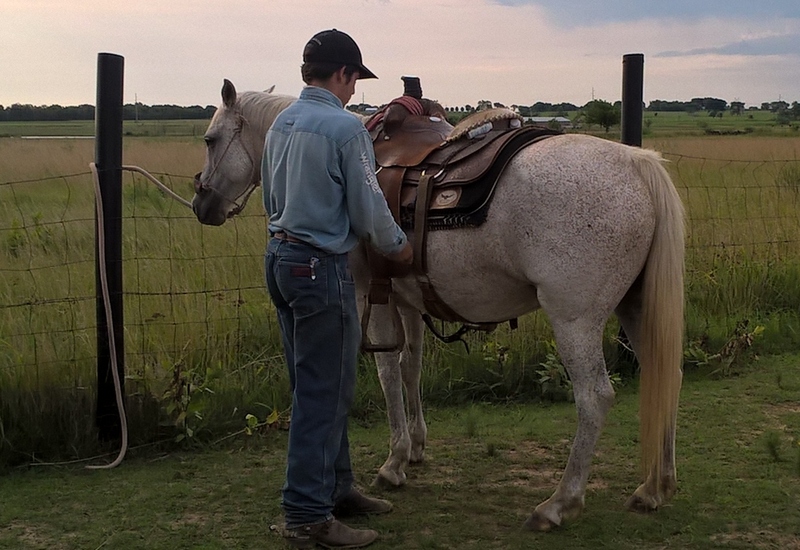 Grass Gland happens when a horse eats off the ground, say in a pasture for long periods of time. It is an issue with the saliva gland and since the horse has it’s head down while eating the gland doesn’t drain properly. If it doesn’t go away in a few days then we will have to have blood work done to figure out what is causing it. The Mare also has one other issue. We think she is pregnant. She has a bag forming so it might be a month or so out but she looks as if she is in the family way. The truth is she hasn’t been wormed, vaccinated or even seen a farrier in years and she was free in a pasture with an Older Jack. 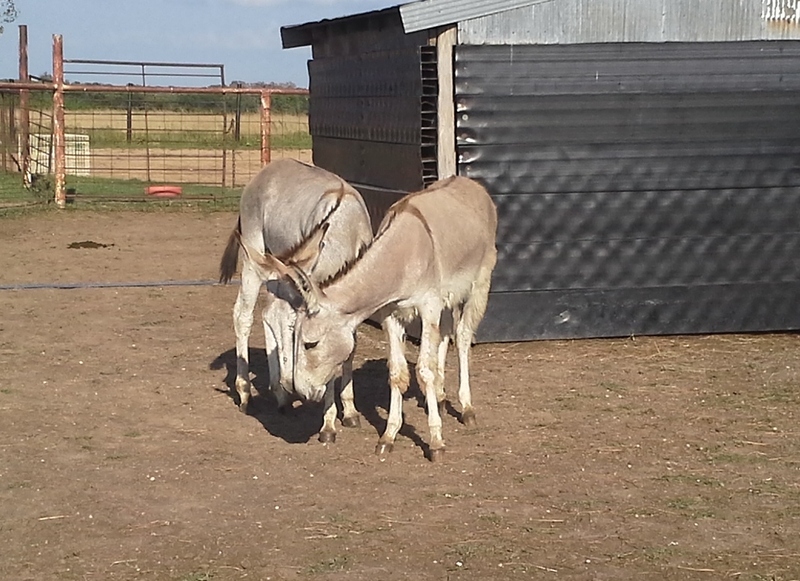 He is the father to the two donkeys as we know he is capable. Anyway, today I called the Vet and got her an appointment to find out the facts. We will have her aged and checked out. Either way, this girl needs some special care and that is going to take money. 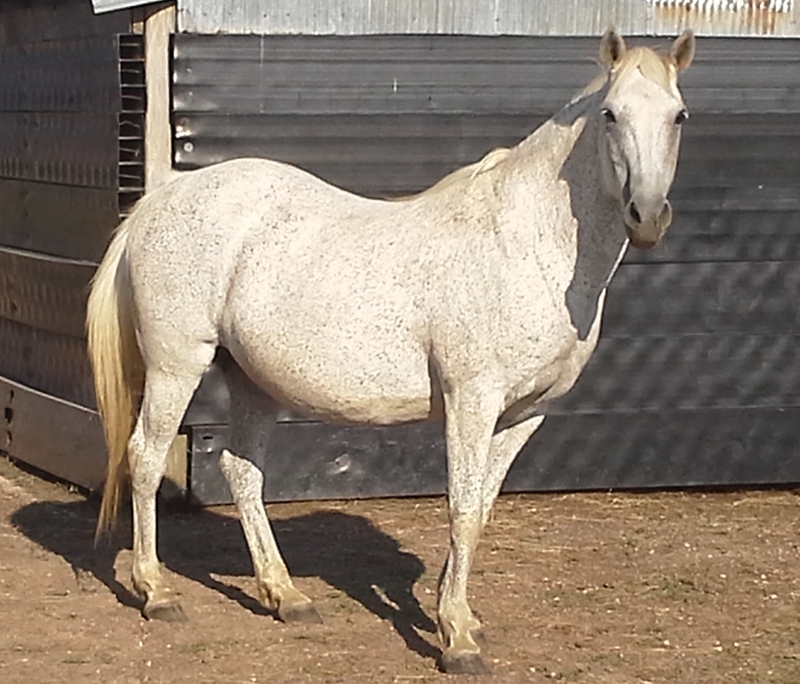 Once we get her lined out and on the right track we will get the farrier here to work his magic as well. In these top to pictures you can see her grass glands … Just look at her throat up by her jaw. Now it is truth time. With the A/C, Hot water heater and the Tractor issues in the last two weeks Mom and Dad are struggling but they know it can’t be put off. That brings me to my other Sponsorship. I posted about some General animal sponsorships yesterday. You can find them HERE. Today I posted One just for the Mare. You can go and help out HERE And remember to make smaller donations just email me (rj@barnontheweb.com) or Mom (farmontheprairie@gmail.com) as no amount is to small as every little bit helps. The Final thing we need to address is this girl needs a name. She can’t be called Sissy for long as she won’t be the new little ones Sister at all. She needs a new name to go with her new life. I know it will be a bit before I can ride her but I am super excited and can’t wait to see what she can do. Anyway, Please post your names and ideas below and just so you know, I want to thank each and everyone of you in advance for everything you all do to help us cover her special needs. So this is just a quick note to let everyone know that we hear you. We have been told in person and online that while we have wonderful products that some people have a collection that they still haven’t used. That doesn’t stop them from wanting to help support the work we do on the farm. And let’s face it sometimes we just don’t want to have to purchase anything. So we explored our options. What is this wonderful thing we speak of?? Introducing our new Sponsorship Programs listed on our Webpage. You heard right. You can now sponsor the animal of your choice or any of our educational programs and keep up to date on all our farm happenings if you like. We priced them all at $10.00 but you can add as many as you like. The reason for the $10.00 is that is the cost of an average bag of feed or 5 children’s expenses for most of our programs. While some animals have vet and training bills not everyone feels comfortable donating large amounts. So this way as little as one bag of feed can be donated or as much as you like to cover the bigger bills. Not to mention you can sponsor as many kids as you like to our learning programs. So now I ask that you take a minute to check out all the sponsorships. You can find them HERE and if you feel a little love in your heart please feel free to Sponsor as much or as little as you want. And if you need to make a different arrangement please feel free to email us at rj@barnontheweb.com or farmontheprairie@gmail.com and we will find a way to make your sponsorship happen. Just a heads up I will have a new sponsorship up for a very special needs animal within the next week … Yup it is a surprise!